Squash House Quilts: The Colors are Flying! Candace your quilt is spectacular! I'm going to add this design to my bucket list of quilts that I want to make. I love it. Your new assistant is very charming too! Your quilt it beautiful and I must say that picture of Sasha is adorable! What a sweet sweet face she has!! She is blessed to have such a wonderful home!! looks like Sasha is settling into the Squash House without a problem! She can feel the love. 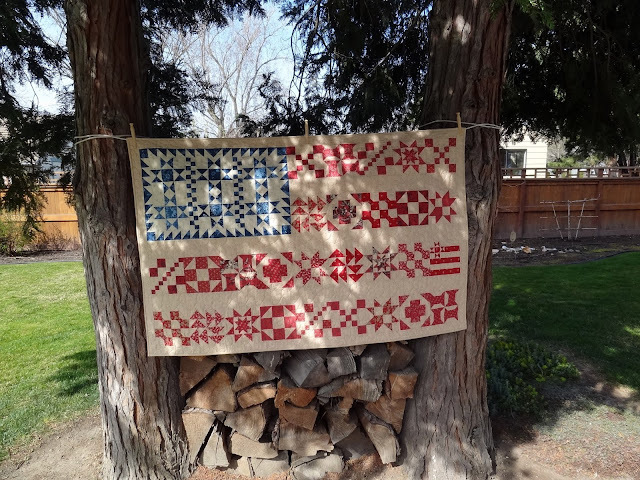 The flag quilt is at the top of my list of projects I want to make when I get unpacked! it is beautiful!!! I hope you can add the Woolie to your blog roll...I'd love to meet new people around the neighborhood! Gorgeous!!!! You did a fantastic job. I have all my blocks done for this, I just need to put them together. You have inspired me. Sasha is so cute, and I'm so, so happy for you and Mr. Squash for having found her! Just love seeing the pictures of her settling right in with you. Your quilt is wonderful, and I'll have you know, it's your fault that I finally broke down and bought that pattern! I think I can hear your quilting assistant saying "All the better to hear you with, my dear." She is a beauty and so is your flag quilt. Love your quilt! And Sasha is a cutie! Love those ears!!! This is gorgeous, it inspired me to make one, I like that you kept the blues inthe same value and the choice of your background was excellent, makes the piecing pop. Fabulous job! Sasha looks s proud sitting on your quilt. She is settling in to her new home well. I love your new assistant as much as I love your flag quilt. The pattern along with your fabric choices and terrific quilting really makes this a spectacular quilt. Oh my Sasha is so darn cute and what a sweet face. Glad she is adjusting and helping you quilt - we all need helpers. 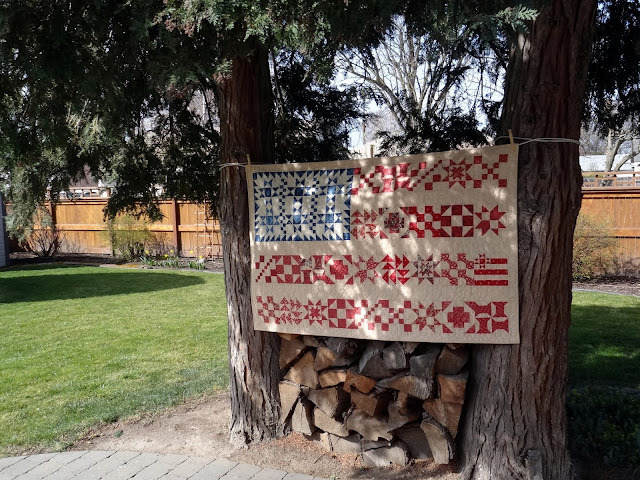 And speaking of quilts, oh my word I LOVE that flag, so does the hubs. It is gorgeous. May I ask what pattern you used?? It is just so gorgeous Candace!! Hugs! I LOVE your flag quilt!! And to have a new sewing buddy? Quite fabulous. Love the flag quilt! My cats love to help with quilting too and each have their own favorite quilts to sit on. YEP!!! I want to make this quilt!!! It's gorgeous and kitty...I'm head over heels in love with ! GRAY kites are my favorite!! Your Flag quilt is truly beautiful, Candace. I came back for not her look at your quilt. Then I noticed just how tall and slender Sasha's ears are! Dang cute! Your flag quilt turned out gorgeous! I love it! 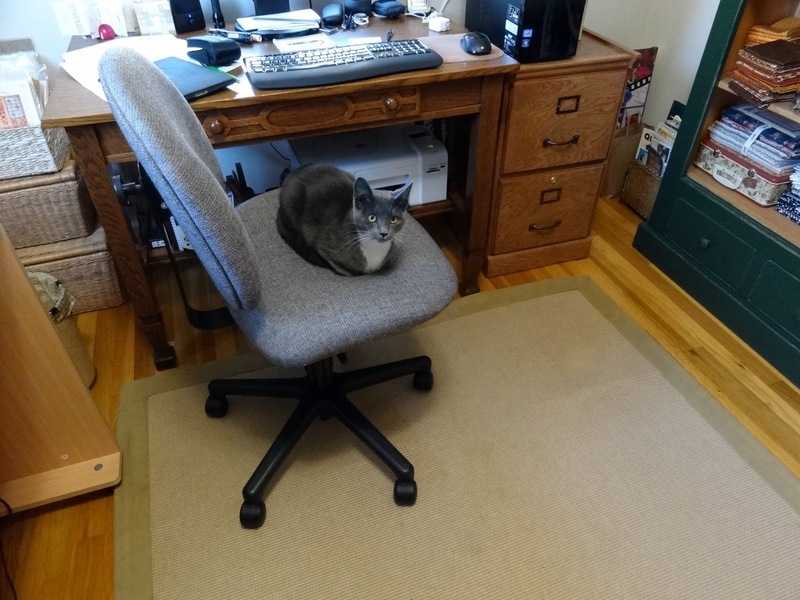 Sasha is so darling, she looks very content in your sewing room! I just L-O-V-E that quilt!!! Gorgeous job by you and Sasha wh by the way is fitting in quite nicely, huh? Now you have an assistant too! She's so tiny, isn't she? Gotta love her! Sure looks like spring in your neck of the woods. I'm trying to be patient...really! What a wonderful quilt!How nice that you have such a lovely quilting assistant. That is one beautiful quilt. Isn't it nice to have a quilting companion, and such a cute one. Your flag quilt is just stunning! Glorious!!! I love the fabric combo too. Sasha looks like sweetest kitty!!! Looks like she'll be a very attentive assistant. Quilt is wonderful...looks like Sasha is one happy kitty! What a beautiful girl she is! I had a kitty named Sasha. She was my constant companion when I was a single lady and well into married life and years with my DD. I miss her all the time. Enjoy your Sasha! The flag quilt is absolutely beautiful! There is no sign of spring here and I've heard we could get snow again next week! Love your new cat and also the quilt! I had to go way,way back to find out who Sugar is. Way back to last June!I thought I remembered she was the cat you made a home for. I'm surprized she never became a house cat. Maybe too much of a free spirit! Your flag quilt turned out so lovely. Great posing spot for quilts! Lovely work Candace. Sasha is so sweet. Wonderful quilt, Candace! Your flag quilt is very unique with tiny blocks and even the colors in the quilt portray the essence of it beautifully! 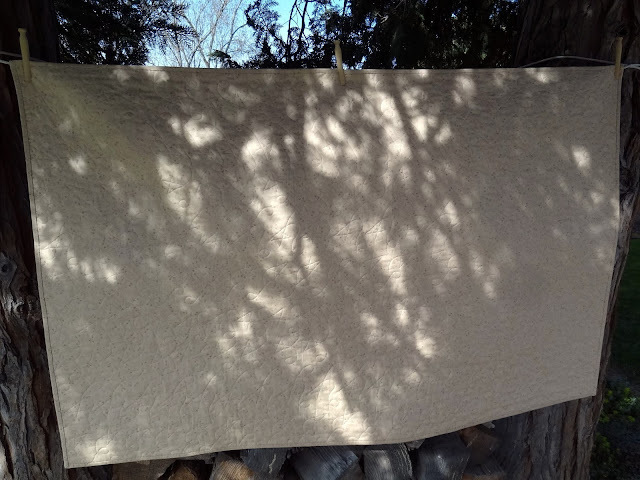 Your quilting adds more depth to it. So nice to see your little Kitten settling in well! Happy Easter! Wow this quilt is amazing. that is so sweet that she making her self right at home. Your quilt is awesome. 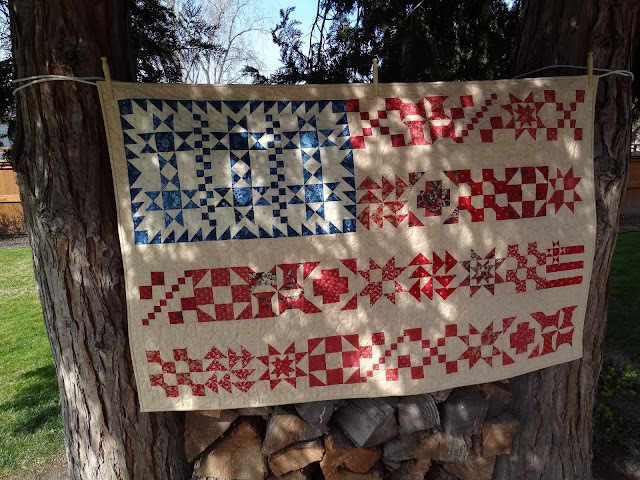 I love that flag quilt! So clever, I have never seen one like that. Love the different blocks as stripes! Love how the kitty is fitting right in! Your flag quilt IS spectacular! That is a lot of amazing detailed work. Little Sasha, Ms.Conehead, is darling no matter what "accessories" she wears! What a gorgeous quilt! And love the photos you took! I am new to your blog and just love your flag quilt. Is there a pattern? I would love to make this quilt!